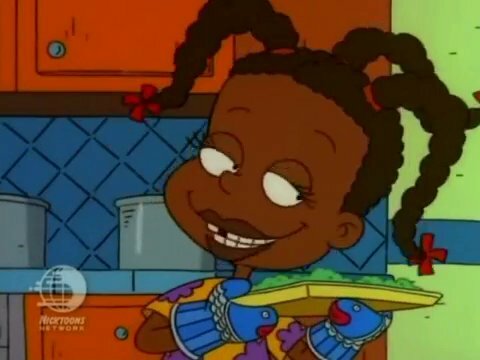 This week’s entry is Susie Carmichael, a recurring character on the popular 90s Nickelodeon franchise “Rugrats.” Susie is voiced by Cree Summer. Susie’s first appearance is in the episode “Meet the Carmichaels.” She’s shown to be the youngest of several Carmichael children. Susie’s father is the writer of a popular in-universe cartoon (“The Dummi Bears,” a Care Bears-like franchise). Her mother’s had various occupations through the show’s run, though mainly shown to be a doctor. Being Angelica’s age, Susie also serves the same role as an older child to Tommy, Chuckie, etc. Unlike Angelica, Susie’s much kinder, and thus is actually liked by the babies. Susie also tends to be better at certain things than Angelica, which has led to the occasional rivalry/conflicts between the two. Susie appeared in two “Rugrats” spin-offs. The first one, “All Grown Up!,” is a flash-forward to the “Rugrats” cast’s pre-adolescence/adolescence, with a 13-year-old Susie and Angelica attending middle school. Susie as a teenager is shown to have various interests, including singing. Susie’s intelligence is also prominent here, as well, as she’s shown to be an excellent student. The second spinoff, “Rugrats Pre-School Daze,” is rather odd—only four episodes (yes, four) were produced and aired! This (very) short-lived 2005 series features the adventures of Susie and Angelica at their preschool (based on an episode/pilot that aired on the “Rugrats” series). And no, I wasn’t able to find out why only four episodes of this series was produced.